Moda Furnishings is a furniture company operating in the UK. They design and manufacture their own lines of indoor and outdoor furniture. While they do have 3 showrooms they are predominantly an online retailer, selling directly to the public. We've worked with Moda Furnishings since 2014, when they approached us to develop a new Magento ecommerce site for their UK and Australian markets. We have supported the maintenance of these site since then, working with them to improve their digital offering to customers. After winning awards for our work with them, they asked us to create a Magento 2 site that would sell the luxury of their products to their customers. Their main objective for the site was to improve customer experience, providing a richer experience of Moda's products no matter what device users arrived from. 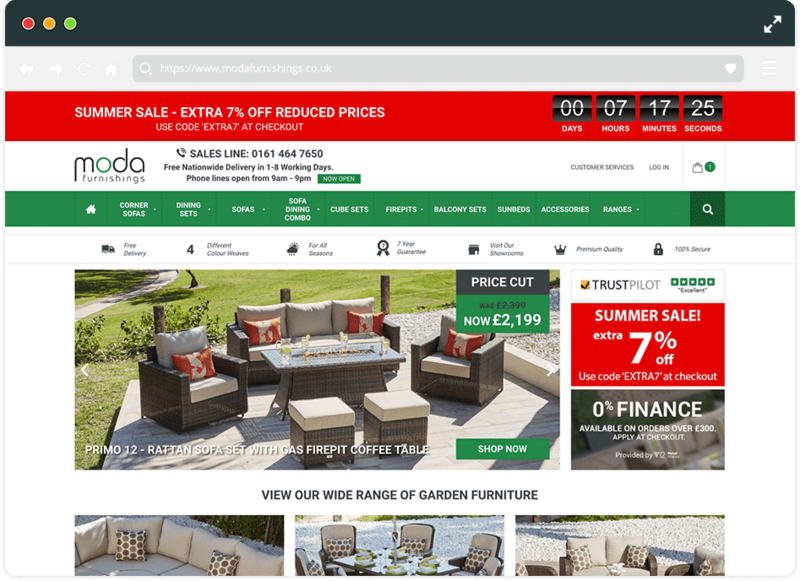 As well as providing Moda with a fully responsive website, we set-up an improved product structure, with attributes and sets to give the team more control over the display of their products and in the newest 2017 Magento site we incorporated a 2D planner to allow customers to plan their furniture layout. The new Magento site has already exceeded the client's expectations as well as being nominated in 2 categories for the Northern Ecommerce awards 2017. Our original work for Moda Furnishings Australia was a “clear winner” at the Northern Digital Awards as it walked away with the prize for Best Ecommerce Website in 2016. It was recognised for breaking into the Australian market and “establishing great results very early on”.